Elaine Giles presented a session titled extolling the virtues of mobile learning and not relying on desktop machines. Elaine said that we don’t always know how content is being consumed now. Elaine demonstrated a lot of different sharing and interaction between mobile and desktop devices. 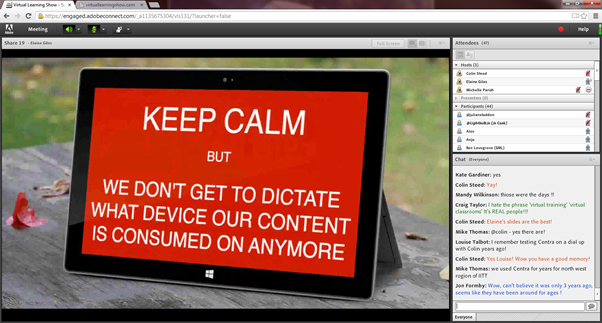 I never thought about sharing desktop stuff through a tablet and then linking that to a webinar/classroom. Elaine suggested that “desktop may to continue to dominate for creation, I doubt it will for consumption. Convenience of mobile will drive it’s adoption”. 1) How important it is to setup and frame what you are delivering – no matter if it’s in the write up of the session. I felt a bit lost at the beginning of this session and had to read the session setup again from the website. If I was prepared for this being a demo I wouldn’t have felt disengaged. 2) The technology and software is there to link desktop and mobile devices, to share between and through them, as Elaine Giles and Mike Thomas demonstrated. This provides a great number of online training options that a lot of us didn’t realise. There are still issues for some people/organisations with regards Firewalls and up to date software, but the potential is certainly there now. Phil Green opened with a Phyllis Diller quote “we spend the first twelve months of our children’s lives teaching them to walk and talk and the next twelve telling them to sit down and shut up”, suggesting that this is what some online learning is like. Phil focuses on meaningful interaction. For me his opening interactions, whilst perhaps a little bit of fun and a bit of an ice breaker for some, for me lacked some pace and context.